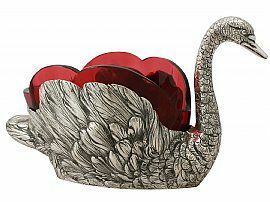 This exceptional antique Italian cast 800 standard silver centrepiece / sweet dish has been realistically modelled in the form of a swan. The body of the dish has been embellished with chased decoration reproducing the fine details of the swan's feathers and anatomical features. The centrepiece is fitted with a removable cranberry coloured glass liner; the shape of the glass parallels the swan's wings. * Italian silversmiths rarely submitted pieces for optional official hallmarking. It was the norm for silver items to be marked only with the '800' (purity degree 800/1000), sometimes coupled with the silversmith's hallmark. This antique swan centrepiece is an exceptional gauge of silver, exceptional quality and in exceptional condition. The hallmarks struck to the underside of the base are very clear. Reflections in photographs may detract from the true representation of this piece of antique Italian silverware. Height to top of head 11.5cm/4.6"